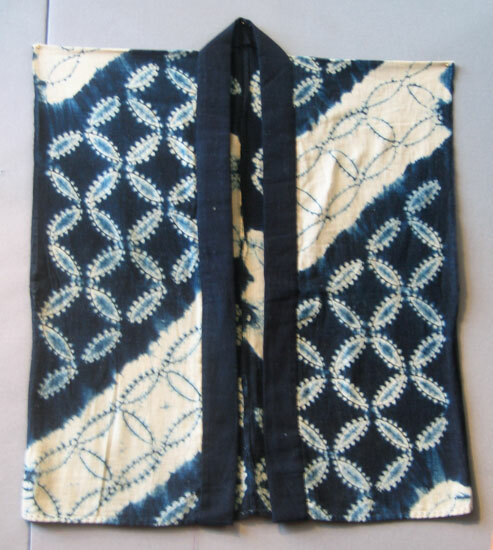 Following the vest theme of the previous post, here is a fabulous example of indigo shibori from Honeychurch Antiques of Seattle, Washington. This piece features shibori done in orinui and shirokage (white shadow) styles. The white bands would have been bound and reserved during the dye process, making this a rather labor intensive textile. Dyeing would have involved several different steps to achieve the overall multi-hued effect. The solid indigo blue lapel gives the eyes a welcome rest from the excitement of the rest of the garment. The interlinked circles represent shippou tsunagi (七宝繋) or shippou mon (七宝文), also known as “Seven Treasures”. Next is a yogi, or sleeping kimono. This would have been used as a coverlet over a futon, and as such is usually stuffed with cotton, making it quite heavy. Many yogi that leave Japan have their stuffing removed to make them less bulky and less expensive to ship. While this may cause the garment to be considered not as “authentic”, it does make the yogi lighter and easier to display, which I find a worthwhile trade off. This particular yogi has a boldly rendered kamon, or family crest*, a typical decoration for an intimate item that would have been proudly used in the home. 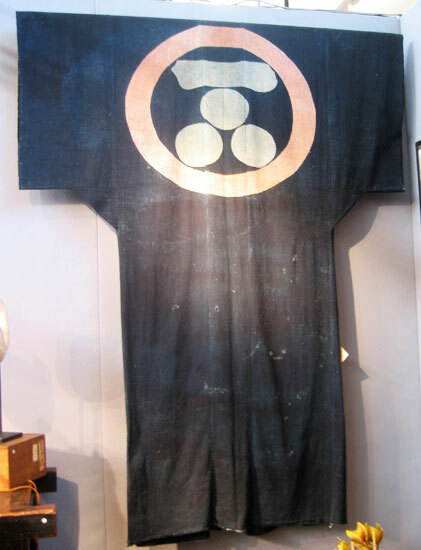 Yogi were often given as wedding gifts with a family crest and other felicitous symbols dyed in the tsutsugaki technique. 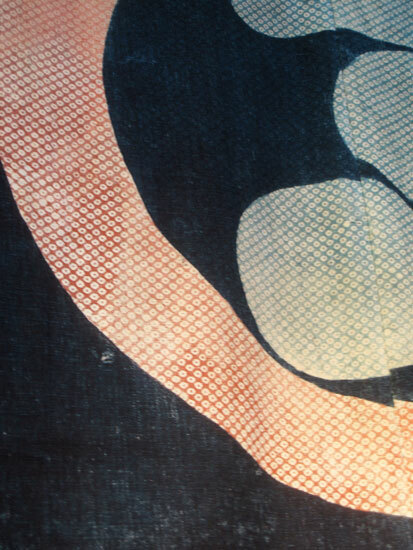 For example, what at first appear to be red and light blue kanoko shibori on this piece are actually carefully rendered dots hand dyed using rice paste resist. The cloth shows quite a bit of wear, which I find appealing. It’s evidence that the yogi was used and appreciated in its time. Thank you to John Fairman for his generous assistance! I will be showing more items from Honeychurch Antiques in a future post. *According to Crest Japan, this particular crest represents a star.